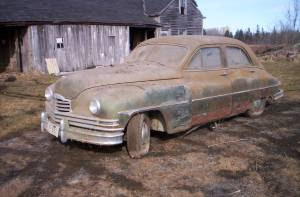 This is a little older than the cars I usually post, but I thought it was pretty cool that the seller included pictures of the car and the barn it was found in. I'm not all that knowledgeable about Packards, but my guess is that this is a Packard Eight. Packard was a force in the US luxury car market until the 1950s when some design and management mistakes lead to a merger with Studebaker and the ultimate end of the marque in 1958. The engine in this car is a "L head" 8. Even in 1949 it was an old design and not very efficient. It put out just 130 HP. This car is a genuine barn find. The seller says it's complete except for the horn ring. I have no idea if it's restorable, but if you buy it I'd love to know what you do with it. 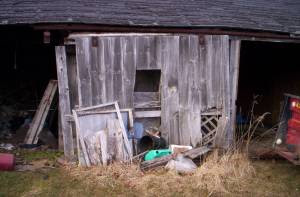 Located in Gardiner, Maine, click here to see the Craigslist ad. A big thanks to Paul for sending me this link! 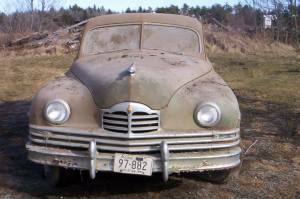 The 'L-head V8', doesn't make sense, Packard did not have a V8 in 1949. L-Head motors are 6 or 8 straight motors. 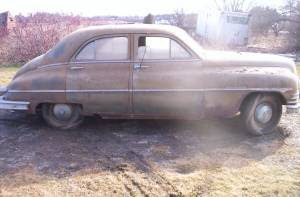 1949 was the 23d series as Packard called it. Being so complete it would be a good 'starter' project for a Packard fan. Just getting into older cars. My error. It's, of course a straight 8. I wrote V8 out of habit. I corrected it. Thank you!